The Biorad CFX384 Real-Time PCR System delivers accurate quantification for up to five targets within large volume reactions. The qPCR can also perform target discrimination as well. The Bio-Rad CFX delivers the latest Real-Time PCR technology while providing a platform which can run as a standalone system, or software driven if so desired. To perform reproducible results, each sample well of the Real-Time PCR must maintain uniform temperature throughout each incubation step. The BioRad CFX384 does so by utilizing its six independent thermal electric modules which are controlled either through the CFX Manager software, or by the built-in microprocessor controls provided with this qPCR. These controls not only manage heating, but also the cooling element of this system, even during ramping of the Thermal Cycler. The BioRad CFX joins the company of the Bio-Rad CFX Touch and Deepwell Touch as one of the highest sought after Real-Time PCR systems on today's market. It's optical reaction module converts the BioRad C1000 LCD thermal cycler chassis into the powerful and precise system which dramatically shortens thermal cycle run times into minutes instead of hours. The CFX Manager provided with the BioRad CFX384 is extremely easy to use and comes equipped with built-in protocols required for Real-Time PCR reactions. Reagents can be purchased at Bio-Rad along with Applied Biosystems as some of their PCR reagents work with this system. The CFX Manger software from BioRad allows you to set the optimal temperature of your experiments by monitoring and tracking results in real-time using the built-in gradient thermal cycle feature. With the Bio Rad CFX you can program up to 24°C throughout the reaction block during any step in your assay. This provides unsurpassed temperature uniformity along with reproducibility in every gradient zone. In addition, the Bio-Rad CFX Real-Time PCR allows for quick setup with factory calibrated dyes. Users can easily monitor real-time data on the LCD Screen, or within the CFX Manager software. Having this feature allows the user to make quick adjustments to your protocols which in the end will result in higher productivity. Moreover, the data collected from the qPCR system can easily be modified and quickly exported to several different file extensions. All in all this system will allow you to quickly set up runs and monitor amplification traces in real-time on the integrated C1000 base with the Bio-Rad CFX. The system is extremely easy to use, power and will make for high quality results. Contact us today to learn more about the BioRad CFX384 Real-Time PCR. ThisBiorad CFX Real Time PCR has been fully tested and validated by our service department. 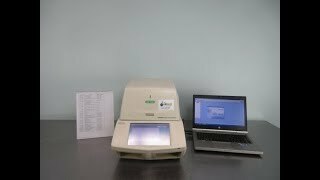 This qPCR has passed all system diagnostic and spectral test, instrument is in excellent working condition. All of our lab equipment comes backed with our standard warranty. Should you have any questions, please don't hesitate to contact us.